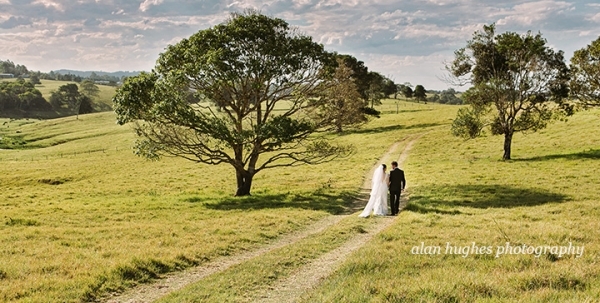 Everything about Kristy and Phillip's Maleny and Flaxton Gardens wedding was organised with precision and much care and thought...and also mostly quite a while ago. There was so much love and affection for this couple (including from the suppliers!) it was an amazing wedding to be a part of. Kristy got ready at her parent's home surrounded by photos of her family throughout the years, which always makes it extra special - from the cubby house that was made for her when she was growing up to her old bedroom and not to forget a plethora of animals including turtles, birds, cats & dogs. You see Kristy cares and looks after 2 legged and 4 legged creatures equally! I caught up with Phillip getting ready at Flaxton Gardens before heading to the Little White Wedding Church for a beautiful ceremony by minister Kaye Pitman. Other suppliers that added to make the day were Powder Me Makeup studio; Rolling Scissors for the hair; flowers by Ginger Lily & Rose Floral Studioand; reception music by Wayne Wiltshire and videography by Ben from Innovate Media.